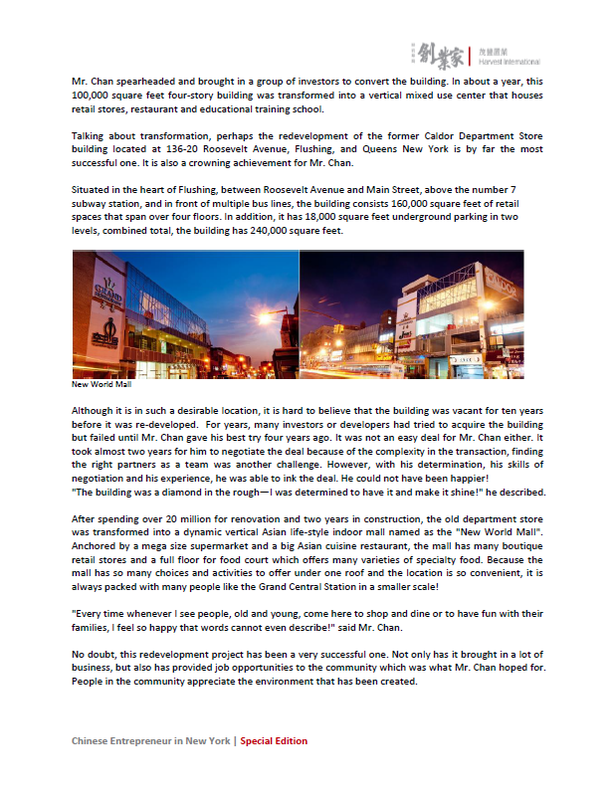 Manhattan, NY – Harvest International is pleased to announce that they have inked a 4,650 square foot lease at 37 St. Marks Place, New York on behalf of 99 Favor Taste, a famous and trendy Chinese Hot Pot and barbeque restaurant that currently operates in two other locations, Chinatown and Brooklyn. 99 Favor Taste is the only all-you-can-eat hotpot and BBQ restaurant in NYC. They offer six choices of hot pot broths, which serve as soup bases for their thirty-one different kinds of freshly prepared meats and vegetables. Private rooms are available for family gatherings, birthday parties, and special events. The addition of this store with Qing-Dynasty-styled interior designs, bring delicious and unique foods and entertainment option to the neighborhood. Harvest International’s Jacob Ding handled this assignment. 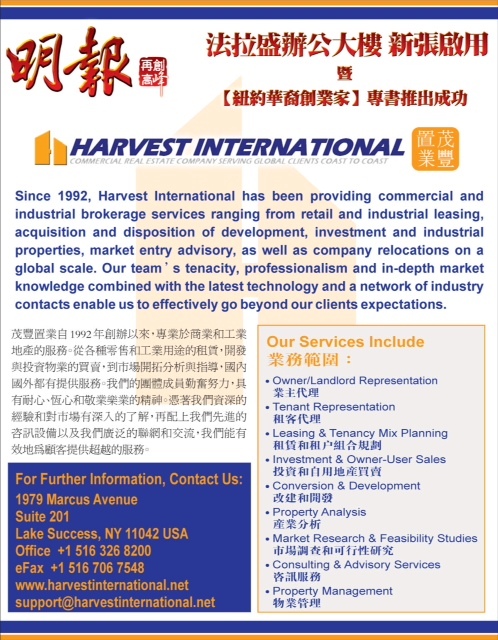 Since 1992, Harvest International has been providing commercial and industrial brokerage services ranging from retail leasing, market entry advisory, acquisition and disposition of investment and industrial properties, as well as company relocations. 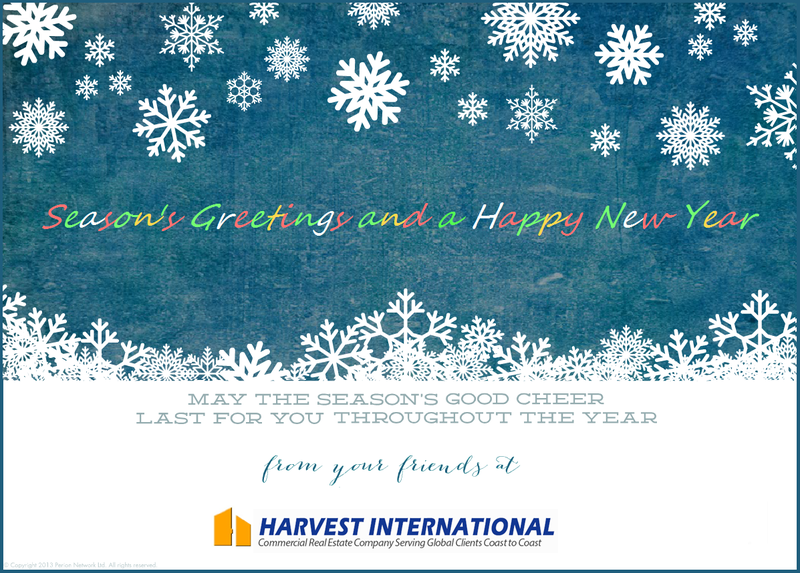 For further information, visit http://www.harvestinternational.net. This Chinese New Year, also as known as the Spring Festival, falls on Monday, February 8th, 2016. The date for every year changes depending on the lunar calendar and usually varies from mid-January to early February and is a world-wide celebration for a sixth of the globe! On Chinese New Year day in China and in Chinatowns all over, dancing lions and dragons, loud fire-cracker noises, beating drums and clashing cymbals parade up and down city blocks to scare away evil spirits and bring health and good fortune to store-fronts and households. Traditionally, the drawing of loud noises were intended to scare away ‘Nian’, a folk monster that would invade and eat livestock and children. Because of this folk tale, the Chinese would refer to the new year as “Guo Nian,” meaning the passing of the year. So the celebration is to commemorate the past year and the start of a new one with close family and friends–it is a time for family reunions and the building of close relationships. 2016 is the start of a new zodiac animal and this year, it is the Monkey’s time to reign. Predictions of personal health, wealth and lifestyles are told to be reflected in individuals’ zodiac sign and how it coincides with the current zodiac animal. The Chinese New Year/Cultural Festival Parade in New York City will start on the first lunar day, February 8th at 11:00 AM and end with a Firecracker Ceremony at noon. Gong Hay Fat Choi, in Chinese means, best wishes and a prosperous new year to all! Harvest International wishes everyone a Happy Spring Festival from our family to yours! Star Network celebrates ‘Power Women’ in Long Island. Congratulations to our very own Daphne Chan for being awarded! On December 3rd, 2015, power women in Long Island walked to receive their award, red carpet-style, at Star Network’s first ever Long Island gala at Leonard’s Palazzo to celebrate Long Island women who demonstrates outstanding business experience and contribution within their professions and their community. Our very own, Daphne Zhou Chan, President & COO of Harvest International, was one of the honorees who received the Long Island Power Women in Business 2015 award. “It’s an honor to be elected to be part of the Long Island Power Women in Business Ceremony Event. Seeing all of these successful women is truly inspiring. 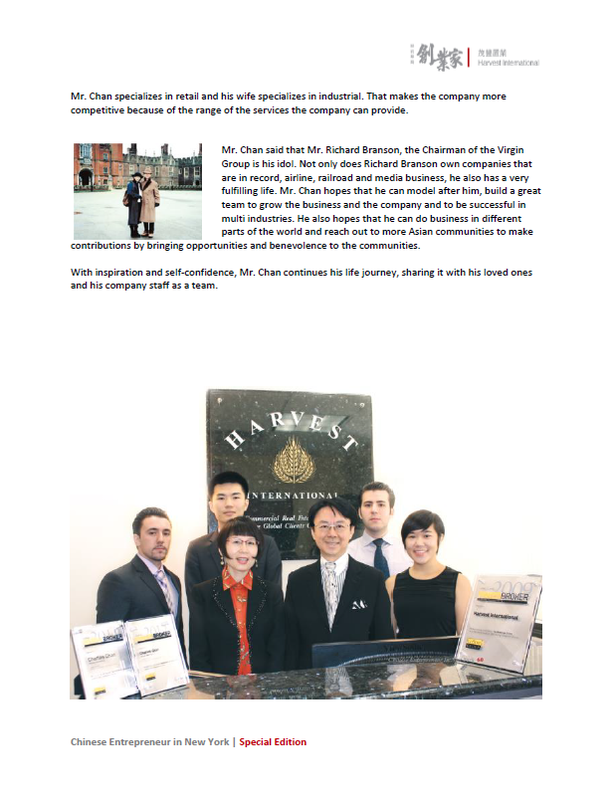 This marks an exciting chapter in my life–if you believe and love what you do, anything is possible,” said Daphne Chan. A night filled with over 700 guests in attendance and influential business women, getting together and sharing their experiences in business and their involvement within Long Island, is a great way to not only recognize these shakers and movers in the community, but a celebration to uplift, inspire and empower all women in business and in other fields. 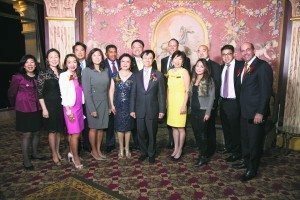 The Asian Real Estate Association of America (AREAA) New York East chapter’s 2015 3rd Annual Dinner Gala was held on Oct. 15 at Leonard’s Palazzo of Great Neck. Action for Outstanding Community Service Award; and Yong Lee, president of X-Treme Care, LLC, for Outstanding Contribution to Real Estate. Citations were awarded from Nassau County Executive Ed Mangano as well as the New York State Assembly office of Edward Braunstein. 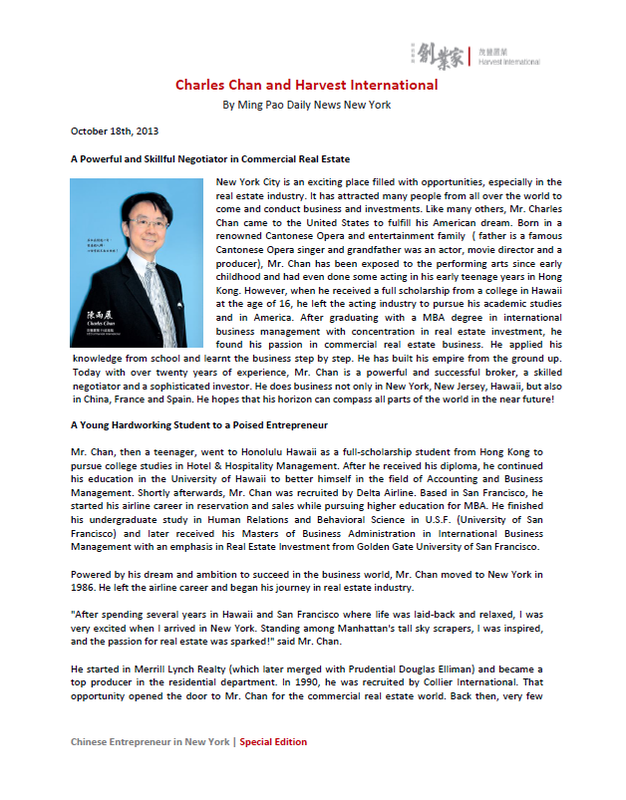 Ming Pao Daily News held their first annual New York Chinese Entrepreneur Award Ceremony and gala for the launching of their new publication series, The Chinese American Entrepreneur in New York. 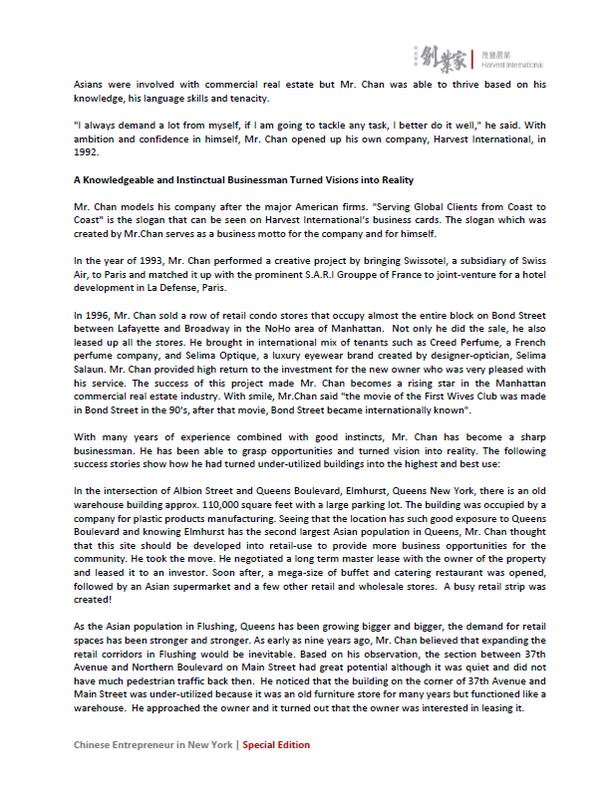 Nearly 800 guests attended this event which was located at the Grand Restaurant in Flushing on October 18th, 2013. One of our own, Charles Chan was selected as one of the honorees. Ming Pao Daily News New York is a Chinese newspaper based in Long Island City and now Flushing, that provides news coverage on the economy, entertainment, health, sports and more. Ming Pao has an average reach of 120,000 plus readers and distributes to Flushing and Elmhurst, Queens; Chinatown, Manhattan; and to Brooklyn. Below is a peek inside the issue. 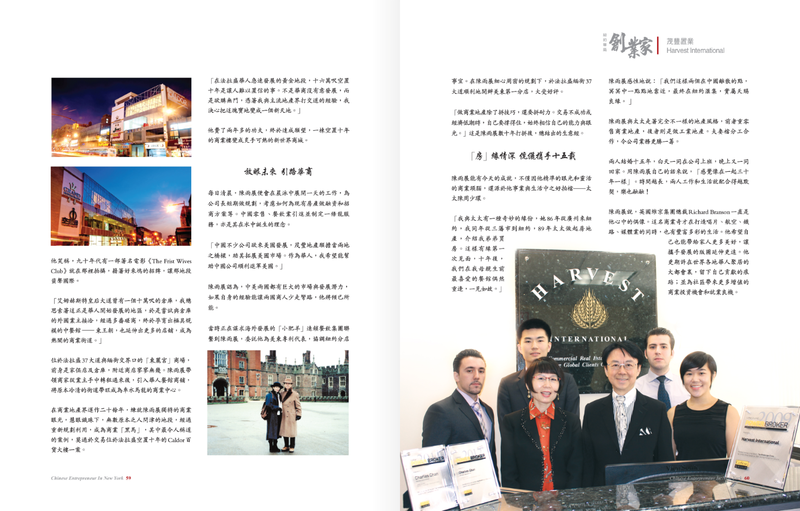 Featured ad in The Chinese Entrepreneur in New York, special edition magazine.